Our Omni Mirror places a modern spin on classic style. This mirror is edgy with its unique mirrored frame that reflects light in a variety of directions, gracing your wall with a playful aesthetic. 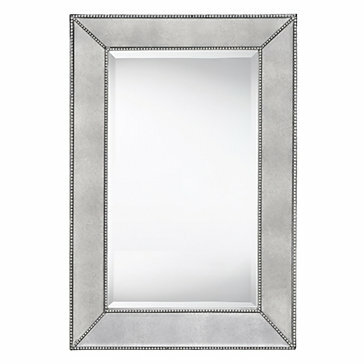 The sharp angled edges and silver beaded trim give the mirror depth and sophistication. Also available as a leaner mirror. [value] => I have been coveting this mirror for over 2 years - searching high and low for something comparable to no avail. The practical side of me debated making such an extravagant purchase, while the "I Love Beautiful Things and Sometimes Beautiful Things Cost" side of me, understood the desire to do so. I'm writing this post so you can guess which side won. This mirror is reminiscent of the circa 1930's Old Hollywood Glamour Era, with its vintage aesthetic appeal, which has been carefully preserved for modern times. She's a Beauty and a Beast and most deserving of her price tag, (though I got it for 20% off during their holiday sale). Still, it's my favorite purchase of 2016 so far. [value] => Gorgeous and extra large! [value] => Love this oversized piece, gorgeous design and makes a huge statement in any room! [value] => This mirror is so gorgeous!! Everybody just falls in love with it. The only complaint is that it does not have feet, or even pads for the floor. It is a leaning mirror so on my hardwood floor I had to add some protection. Would have been nice to have that built in, but make no mistake this mirror is awesome! [value] => Everything about this mirror is perfect: size, workmanship and quality. Purchasing this mirror confirmed that I have really nice taste. It's the most elegant purchase that I have every made. It makes me smile! I have been coveting this mirror for over 2 years - searching high and low for something comparable to no avail. The practical side of me debated making such an extravagant purchase, while the "I Love Beautiful Things and Sometimes Beautiful Things Cost" side of me, understood the desire to do so. I'm writing this post so you can guess which side won. This mirror is reminiscent of the circa 1930's Old Hollywood Glamour Era, with its vintage aesthetic appeal, which has been carefully preserved for modern times. She's a Beauty and a Beast and most deserving of her price tag, (though I got it for 20% off during their holiday sale). Still, it's my favorite purchase of 2016 so far. Love this oversized piece, gorgeous design and makes a huge statement in any room! This mirror is so gorgeous!! Everybody just falls in love with it. The only complaint is that it does not have feet, or even pads for the floor. It is a leaning mirror so on my hardwood floor I had to add some protection. Would have been nice to have that built in, but make no mistake this mirror is awesome! Everything about this mirror is perfect: size, workmanship and quality. Purchasing this mirror confirmed that I have really nice taste. It's the most elegant purchase that I have every made. It makes me smile!